What you eat in Namibia depends largely on where you are and who you’re with. Although certain foods are common to all of Namibia’s ethnic groups, each has their own specialities – some more appealing than others. Game meat, particularly kudu, oryx and other antelope is very common and even forms part of the in-flight offering on Air Namibia flights (much better than the chicken, it should be noted). 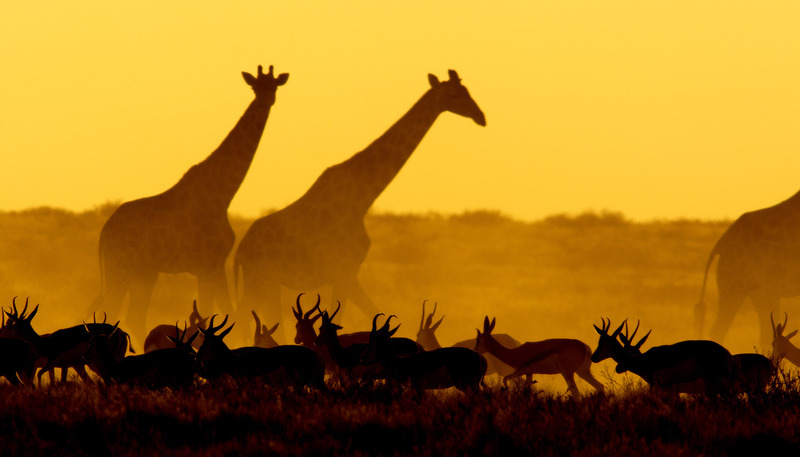 Other game meat on offer includes buffalo, and occasionally, giraffe, while seafood is plentiful and excellent – particularly in Swakopmund and Walvis Bay. Braais (barbecues) are very common among Afrikaaner and German groups, while most African tribes eat plenty of mealie pap (a doughy maize paste) and oshifima, the millet version often served with meat or vegetable stews. South African dishes such as bobotie (a meat pie with a savoury egg custard crust) are also common. Most restaurants will offer Teutonic or international fare, although thanks to Namibia’s desert environment which makes fruit and vegetables especially expensive, menus tend to be heavy on the meat. More German influence can be seen in Namibia’s konditoreien (cake shops), where you can tuck into classics like apple strudel, sachertorte (chocolate cake) and kirschtorte (Black Forest gateau). Afrikaaners also know their way around the dessert trolley, with koeksesters (mini doughnuts dripping with honey) and melktart (milk tart) among the nicest. Breakfasts tend to be a spin on eggs and boerewors (sausage) although don’t be surprised to find a strange meaty extra such as curried kidneys thrown in with your scrambled eggs. With a beer culture the equal of anything in the UK, Namibia has endless varieties of beer, many traditional African millet versions. Despite the desert heat, the country has recently started making its own wine – most of which is excellent. • Windhoek lager (drunk by everyone, the perfect ice-cool sundowner). • Oshikundu (a yeasty-tasting millet beer that is brewed and drunk the same day). • Neuras Namib red wine (dubbed the driest vineyard in the world, Neuras is only possible because of a unique set of underground springs. Produced to South African standards, both the Shiraz and Namib red are excellent). • DAS Pilsner (light beer that is considered a soft drink in Namibia and even forms part of the breakfast menu). • Mataku (strong fortified watermelon 'wine found in northern Namibia; comes in non-alcoholic version).